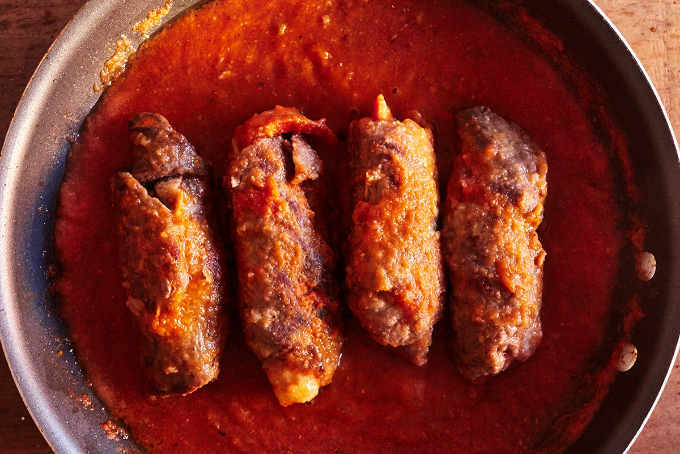 This is a unique recipe for Mexican beef rolls that are stuffed with bacon and banana and cooked in a mild tomato sauce. 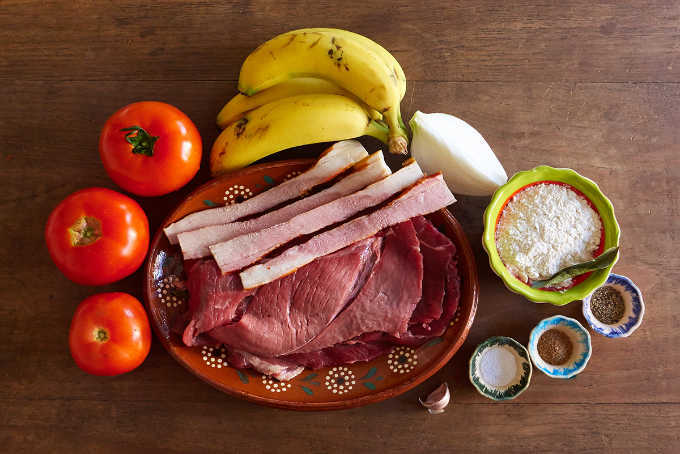 The basis for the dish comes from the cookbook “La Cocina Mexicana de Socorro y Fernando Del Paso.” Beef, bacon, banana and tomato sauce sounds like an odd combination but the flavors work surprisingly well together. 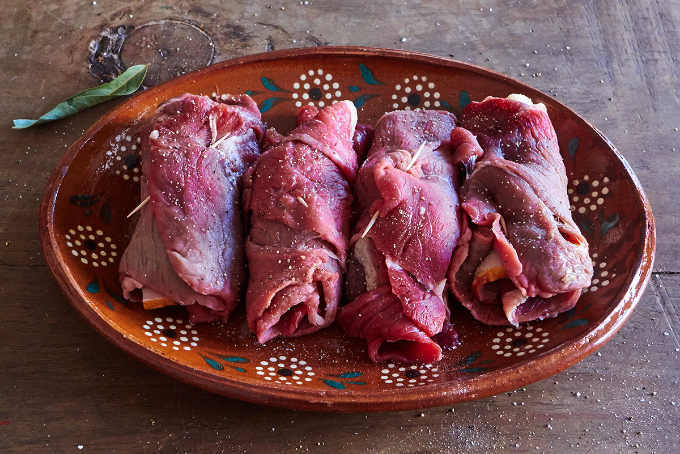 Beef rolls are a satisfying home-cooked lunch time dish typically served during la comida. Preparation is really simple and the results are delicious. 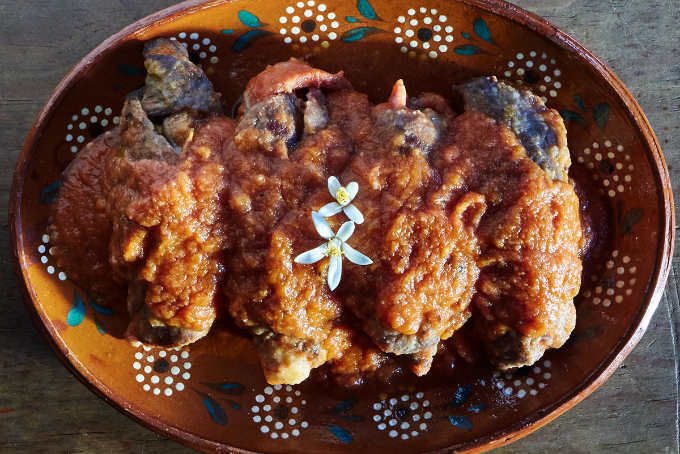 To prepare this dish, you will need thinly sliced beef, bacon, banana, tomato, onion, garlic, flour and spices. Cut each banana into 2 pieces. If they are very thick cut each piece in half lengthwise. You will have some leftover banana. Wrap each piece of banana with one strip of bacon. 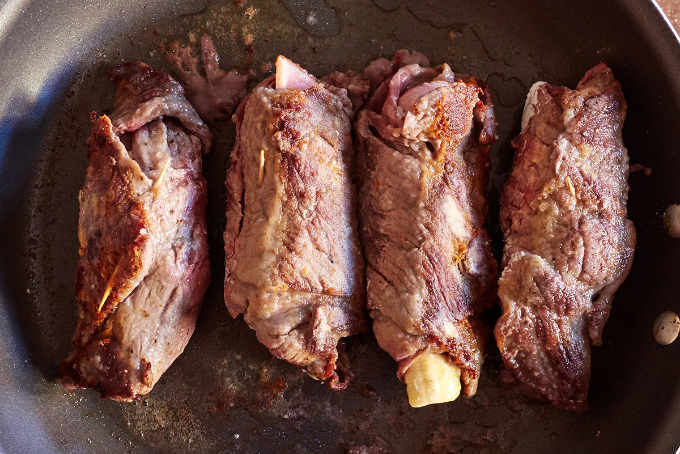 Roll the beef around the bacon wrapped banana. Secure each roll firmly with a toothpick. Season the rolls generously with salt and pepper. First, you will flour the rolls. The flour will help to brown them nicely. Heat 4 tablespoons of cooking oil over medium heat in a large frying pan and add the rolls to brown them. Thoroughly brown them on all sides. Browning adds flavor to the meat and the browned bits that remain in the pan will add flavor to the sauce. When they have fully browned place the rolls on a plate and set them aside while you prepare the sauce. 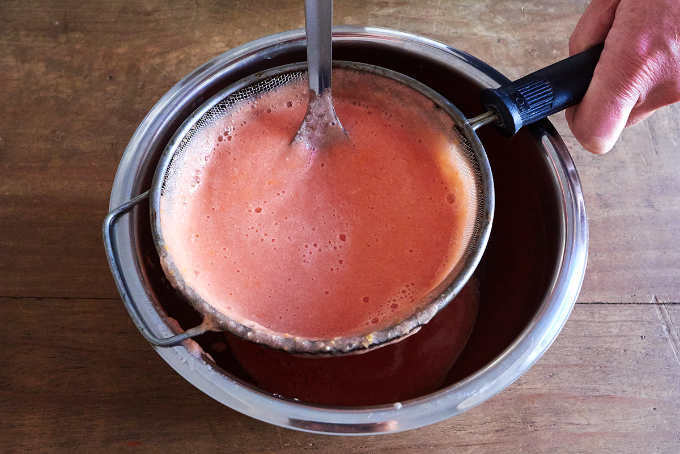 Blend the tomato, onion and garlic with no added water for 2 minutes until the sauce is smooth. 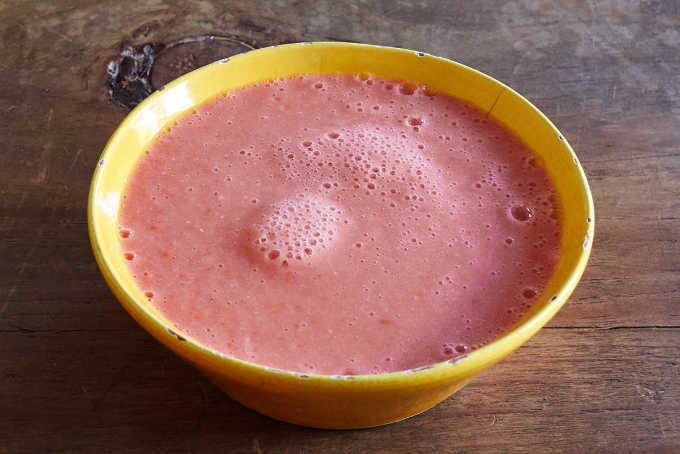 You will get a pale pink paste which doesn’t look too appetizing. That will change when you cook it. Don’t worry. Strain the sauce into a mixing bowl to remove the seeds and skin. Don’t skip this step. It’s important for the texture of the sauce. In the same frying pan that you browned the beef rolls add 2 tablespoons of oil and bring the pan to medium hot. Pour the sauce into the pan to fry it, which is called “seasoning” it. Stir in the salt, pepper, sugar and bay leaf and bring the sauce to a boil. Reduce the sauce from a boil to a simmer. 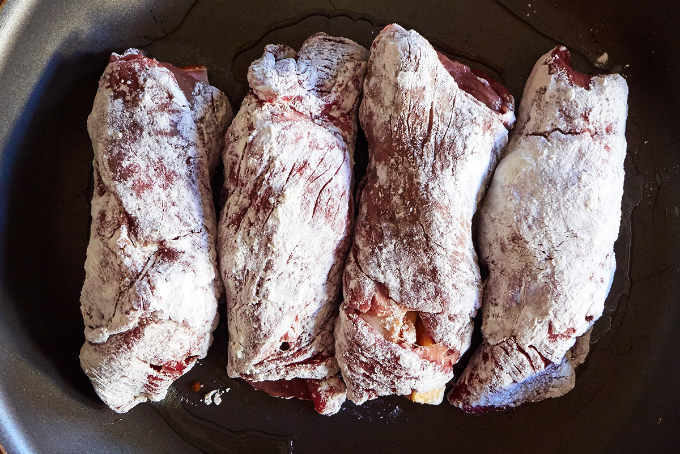 Place the beef rolls into the sauce and cook for 25 minutes. Turn the rolls every 5 minutes and spoon sauce over them so that they cook evenly. 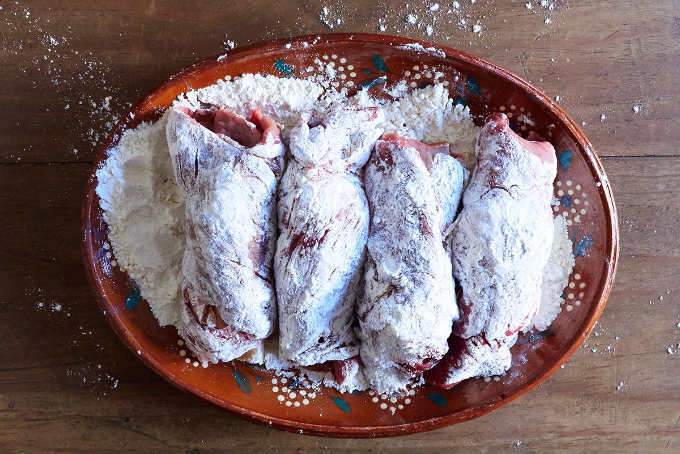 Place the four beef rolls on a serving plate and spoon the sauce over them. Serve immediately. 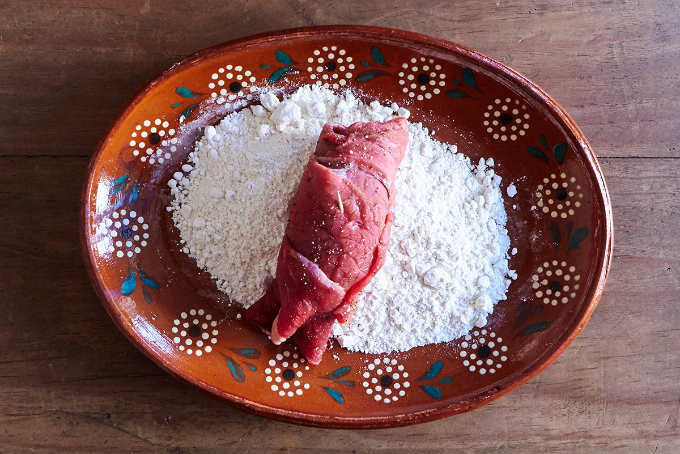 White rice and beans are good side dishes for your beef rolls. Provecho! Enjoy your Mexican Beef Roll Ups. 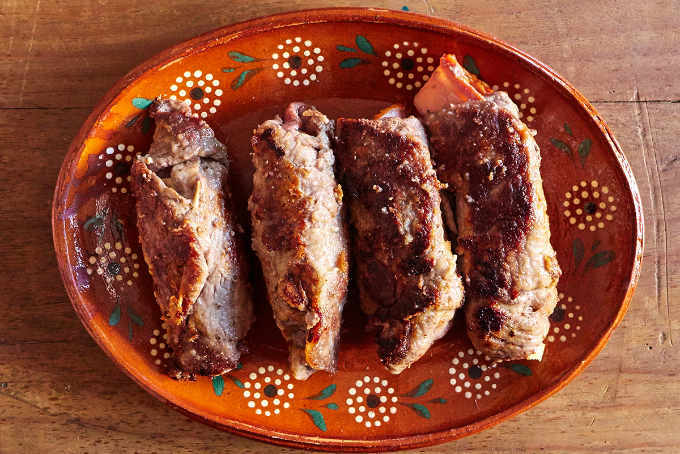 A unique recipe for Mexican beef rolls stuffed with bacon and banana and cooked in a mild tomato sauce based on a dish from the cookbook "La Cocina Mexicana de Socorro y Fernando Del Paso." Cut each banana into 2 pieces. If they are very thick cut each piece in half lengthwise. You will have some leftover banana. Wrap each piece of banana with one strip of bacon. 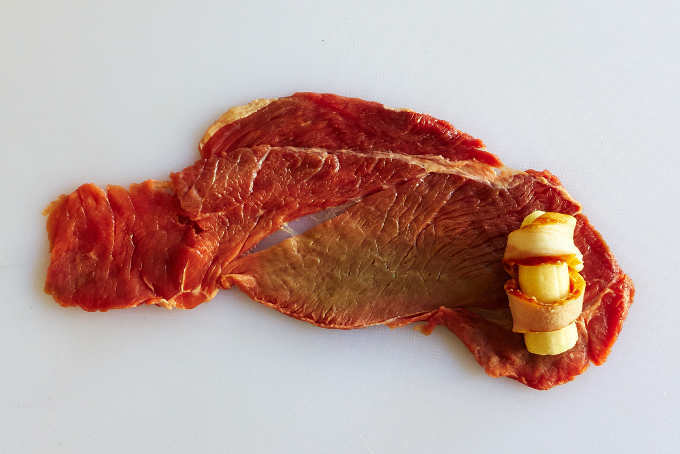 Roll the beef around the bacon wrapped banana. Heat 4 tablespoons of cooking oil in a large frying pan and add the rolls to brown them. Thoroughly brown the rolls on all sides. 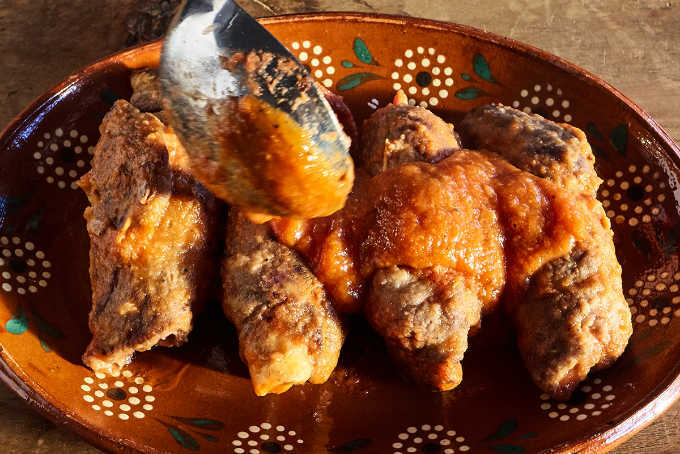 When they are fully browned place them on a plate and set them aside while you prepare the sauce. 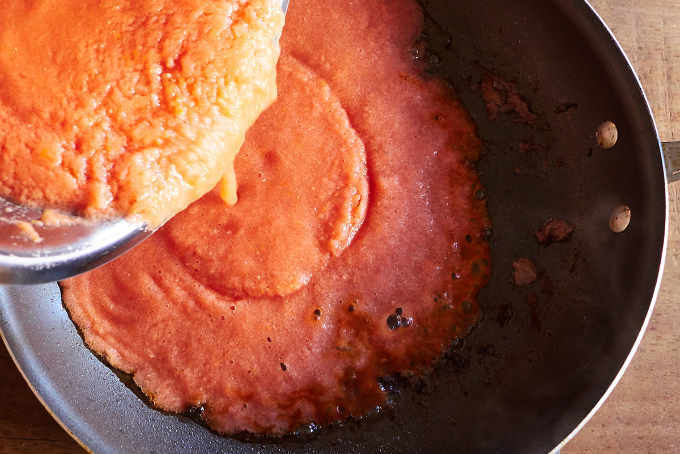 Blend the tomato, onion, and garlic with no added water for 2 minutes until the sauce is smooth. Strain the sauce into a mixing bowl to remove the seeds and skin. Don't skip this step. In the same frying pan that you browned the beef rolls add 2 tablespoons of oil and bring the pan to medium hot. Pour the sauce into the pan to fry it, which is called "seasoning" it. 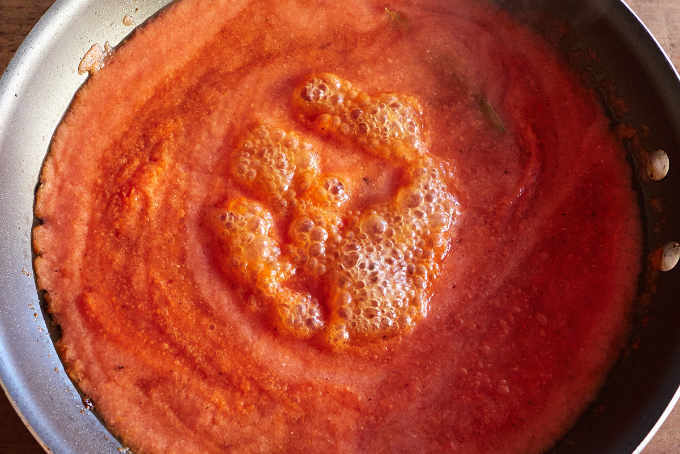 Reduce the sauce from a boil to a simmer. 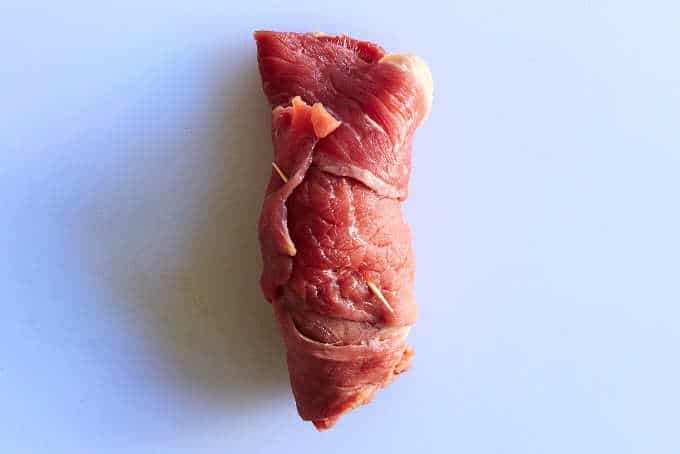 Place the beef rolls into the sauce and cook for 25 minutes. 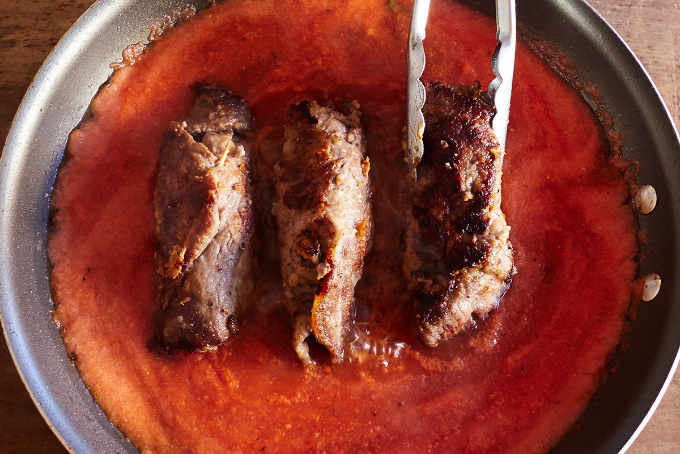 Place the four beef rolls on a serving plate and spoon the sauce over them. This dish is best eaten immediately. It doesn't really reheat well. The tomato sauce for this dish doesn't call for any chile. If you want some heat in the sauce, add 1/2 to 1 chile serrano when you blend the tomato, onion, and garlic. 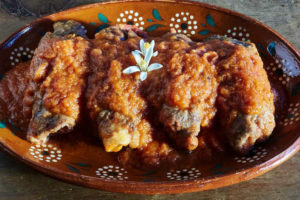 Our easy salsa roja recipe would also go well with this dish.